In addition to its dreadful international crises and politics, 2016 has been harsh for musicians. Some of music’s greatest icons—including Prince, David Bowie, Leon Russell and Leonard Cohen—departed this earthly plane in 2016, but not before leaving us with legendary last words. Still, throughout a tumultuous year, musicians served as commentators and activists, while also providing respite and escapism through their works. 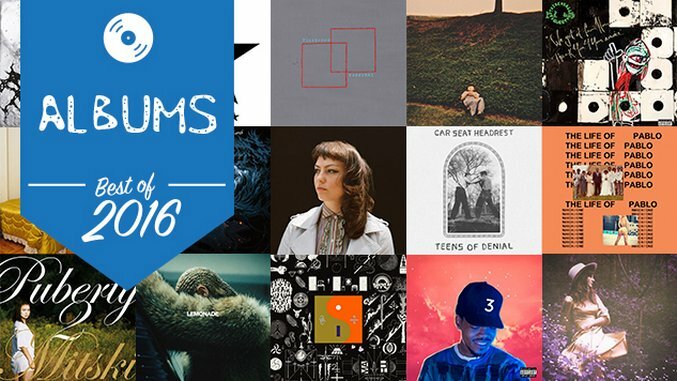 Paste staffers, writers and interns voted on the best, most meaningful, and relevant albums of 2016, yielding nominations for more than 100 LPs. And you can win 25 of these albums on vinyl when you sign up for the free Paste email newsletter. Here are our top 50 albums of the year, and we hope you’ll share your favorites in the comments below. Max Kakacek and Julien Ehrlich, Whitney’s songwriting duo, have been preparing to release this debut album since shortly after their last band, the Smith Westerns, split in 2014. When writing songs together, Kakacek and Ehrlich developed a persona: Whitney is a lonely guy who drinks too much and lives alone. It was probably a pretty easy idea to embody. Both Max and Julien are quick to admit that the songs for Light Upon the Lake were written in the midst of consecutive breakups. They felt a little bit like Whitney, so they built this as a bit of a concept album. 36. Kendrick Lamar, untitled unmastered. Despite their disparate backgrounds, Sam Beam and Jesca Hoop have managed to make an album that’s both hushed and harmonious, one that finds this, their first dual effort, blurring the lines between the sedate and the seductive. Beam’s no stranger to this approach; his efforts with Iron & Wine generally find him dwelling in more cerebral realms. Hoop, on the other hand, has yet to establish an identity with any such distinction; four albums on, she still resides well below the radar. If frolicking on a warm beach in golden light with your best friends had a musical equivalent, it would have to be the debut album from Hinds. Though the Spanish quartet is said to be at the forefront of a growing indie scene in Madrid—a city much better known for many other things—Hinds could have just as easily grown up in a garage a few blocks from the ocean somewhere in southern California. Neko Case, k.d. lang and Laura Veirs, whose unexpected partnership has yielded a stunner of a debut. The 14 songs on case/lang/veirs come with three distinct moods that reflect each musician’s considerable strengths as singers and as writers. Case is the restless one, always on the move through songs at once evocative and mysterious. Lang is the torch singer, wrapping her sensuous voice alternately around tableaus of seduction and heartache. Veirs is the fantasist, conjuring scenarios worthy of Walter Mitty (“From the oriental rug you meet my gaze/ And all my desperation retreats into the haze,” she sings on “Greens of June”). Wilco’s 10th LP Schmilco is an acoustic record but not a slow one—thank God—which proves the right vehicle for the band’s loosest, most unadorned set of songs since its debut. There’s electricity here, if not much electric guitar: “Locator” heaves back and forth with reckless abandon, and like many of the songs on Schmilco, it’s over in two minutes and some change. Several other highlights take an uptempo tact: “Someone to Lose” is a slippery, infectious groove rooted in romantic anxiety, while “We Aren’t the World (Safety Girl)” goofs on the cornball charity anthem “We Are the World” over cartoonish keyboard glimmers. Andrew Bird has fashioned songs out of formaldehyde and “Darkmatter,” “Plasticities” and “Anonanimal”s. But he’s rarely expressed himself with plainspoken vulnerability. Are You Serious, his 13th LP, isn’t a course-corrected confessional—he’s too fond of artful abstraction to write, as he recently told Paste, an “Andrew Bird Grows Up” album. But the singer-songwriter/violinist/whistling aficionado has subtly dropped his guard, using simpler language to explore complex themes. Like Beyoncé and Frank Ocean before him this year, Australian auteur and reigning prince of darkness Nick Cave also opted for a visual aspect accompanying the release of his 16th studio album with his band the Bad Seeds, Skeleton Tree. The album’s Friday release was coupled with a series of global screenings the night before, of a 3D black-and-white film, One More Time With Feeling. So far, Parquet Courts has shown little interest in straight lines. Rather, having released four stylistically diverse full-length albums and two EPs between 2011-15, the Brooklyn band veers all over the place, as if they’re in a hurry to capture all of today’s ideas before a fresh burst of inspiration sends them scurrying off in a new direction tomorrow. The nine new songs that make up You Want It Darker explore very similar territory as 1992’s The Future, but Leonard Cohen’s perspective appears to have shifted slightly since then. On that album, he predicted a future far worse than anything we could imagine, and sadly, events of the past two decades have shown him to be very prescient. The suggestion running through all of the songs on the album is that everybody should be getting ready for whatever fate is waiting for them. In that respect, You Want It Darker could be viewed as a summing up or an accounting of how an individual has lived his life. However, another theme involves making peace with the world and oneself, as expressed in tracks like “Treaty,” “Leaving The Table,” “On The Level” and “Traveling Light” that each examine the duties and pitfalls of mortal life. Coloring Book, Chance the Rapper’s third mixtape and his second project distributed via Apple, is deafeningly religious, brimming with testimonies, exaltations and blessings that are loud enough to rock a megachurch and its town-sized parking lot. Purged of the drug-addled skepticism of Acid Rap and pulsing with the free-wheeling spirit and zeal that bolstered Surf, Coloring Book is a breezy listen: direct and purposeful. One thing’s clear: Kanye is searching for answers. Weeks before its release, he defined Pablo as “a Gospel album”—the equivalent of constructing a steeple on a Walmart and calling it a church. This isn’t a gospel album, despite its occasional, vivid bursts of feel-the-spirit belting (that’s Kirk Franklin on opener “Ultralight Beam”) and Christian references. In fact, Kanye’s never focused so hard on carnal pleasures, often aggressively so. Ocean has mostly existed in suspended animation in the interim between channel ORANGE and Blonde, leaving his fortress of solitude for the occasional feature or broadcasting his thoughts from within its dungeons via oblique tumblr dispatches. His absence from public life has been so absolute that it has spawned memes, conspiracy theories and fan fiction about him being seen IRL. Blonde is just as evasive—Ocean obscures his face on the album cover—but it’s his most resonant work yet, constantly pushing past profound alienation to connect, however fleetingly, to something, someone. Virginia singer-songwriter Lucy Dacus’s No Burden is astounding for two reasons. First off, this is the young artist’s debut album, but it is surprisingly genuine and mature. Second, she reimagines the indie folk and rock scene because she does not fall victim to the one-dimensional melancholic trope and rather opts for a frank and beautiful style. The Low End Theory and Midnight Marauders are great Tribe albums. But We got it from Here… Thank You 4 Your service is a great Tribe album that has André 3000 and Kendrick Lamar. That’s just math making a strong case that this LP is the best thing this group’s ever done. With absolute certainty, “The Space Program” and “We the People…” are the greatest one-two opening punch in their catalog, and fairly strong arguments that a band would make a better President than our current elect. Will Toledo is the creative force behind this Bandcamp success story. The new album is out after his Matador debut, Teens of Style, which culled from his self-released records for songs he wanted to give a more official treatment too. Now though, he’s coming through clearer than ever. His voice isn’t shrouded by reverb and distortion, and his songwriting is crisp as can be. This style of indie rock can benefit from the lo-fi treatment, and it did for most of his career, but the clarity here puts on display that his talent really carries through as well if not better with a cleaner production style. The album Lemonade tells the story of a woman experiencing the high highs and low lows that come from loving, from believing, from existing. She’s confident (“6 Inch”), she’s scorned (“Hold Up”), and she’s vengeful (“Don’t Hurt Yourself”). She’s painfully aware (“Pray You Catch Me”), blinded, then restored by love and lies. She’s open, she’s hopeful (“Sandcastles”), and she’s incomprehensibly fierce (“Sorry”). She is everywoman—in love and in pain (“All Night”), defined as much by her romantic life as she is by her parents (“Daddy Lessons”), and the cultures and worlds that birthed her (“Formation”). The death of David Bowie in early 2016 somehow seemed to set the tone of the rest of the year. His many fans and supporters thrilled at the release of his latest album Blackstar, a masterpiece that found him threading modern jazz into his already multi-colored tapestry of sound, and talked excitedly about what looked like the start of a bold new chapter in his storied career. Two days later, all that hope and promise was yanked away when the news came of Bowie’s death due to liver cancer. Quickly, the discussion about Blackstar turned from celebratory to eulogistic as many of us pored over the lyrics and the two videos he made for the album for clues and signposts. Bowie did not disappoint on that front, as the LP is suffused with references to the inevitable and to looking back at his own legacy as one of 20th century’s most innovative pop stars. With his clear-eyed view of his divine status, Blackstar becomes, then, a worship album about Bowie. His chosen cadre of musicians certainly treat it as such. Though the hard grooves that the members of Donny McCaslin’s quartet aren’t too far afield from what they presented on their 2015 album Fast Future, it’s still obvious that they’re pulling their punches a bit, all the better to let their new bandleader run as wild as he pleases. True to the tone of the record, Bowie is almost a spectre throughout. His vocals are often doubled in tight harmonies, or given an alien-like echo that might as well be broadcasts from the beyond. He never sounds less than marvelous, through. After 45+ years of work, his voice has lost a little of its high end, but is possibly stronger. It’s definitely capable of reaching more sinister aims on songs like “Whore” and “Girl Loves Me,” and with a smattering of vibrato, he can unearth some still-rich wells of emotion. Bowie circles back to himself on Blackstar as well. During the breakdown of the title track, his backing vocal insists that he’s not a rock star or a film star, even though he’s played both roles. “Girl Loves Me,” on the other hand, returns to his fascination with the made up language of A Clockwork Orange and uses, at times, a similar rhythm that recalls “Chant Of The Ever-Circling Skeletal Family” from Diamond Dogs. Be sure to enter to win 25 of these albums on vinyl.